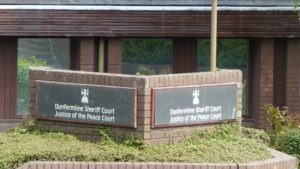 A Dunfermline woman set fire to her ground-floor flat and blamed it on “junkies”, a court has heard. Elaine Mackie (54), currently a prisoner at Edinburgh, appeared from custody at Dunfermline Sheriff Court. She admitted that on 4th October at Mackie Place, she culpably and recklessly set fire to a curtain whereby the fire destroyed the curtain, a wall and floor. Depute fiscal Sarah Lumsden said the fire took place in Mackie’s home, a ground-floor flat owned by Fife Council. At 9.42pm police received a phone call from Mackie claiming two people were in her garden. At 9.55pm she called police again asking when officers would be attending and then she made another at 10.21pm saying she had set fire to her curtains. The emergency services attended and police officers who spoke to her could see she was “clearly intoxicated” said the depute. “She told them that junkies had set fire to her curtains,” added Ms Lumsden. With the fire put out, police left with Mackie going to the home of one of her neighbours. The fire caused damage which cost over £2800 to repair, the court was told. Defence solicitor Alexander Flett said he believed his client should have had more support in the community. “She seems to have slipped through the net for people with learning difficulties,” he commented. Sheriff Charles MacNair called for reports and Mackie will remain in custody until sentencing on 12th December.